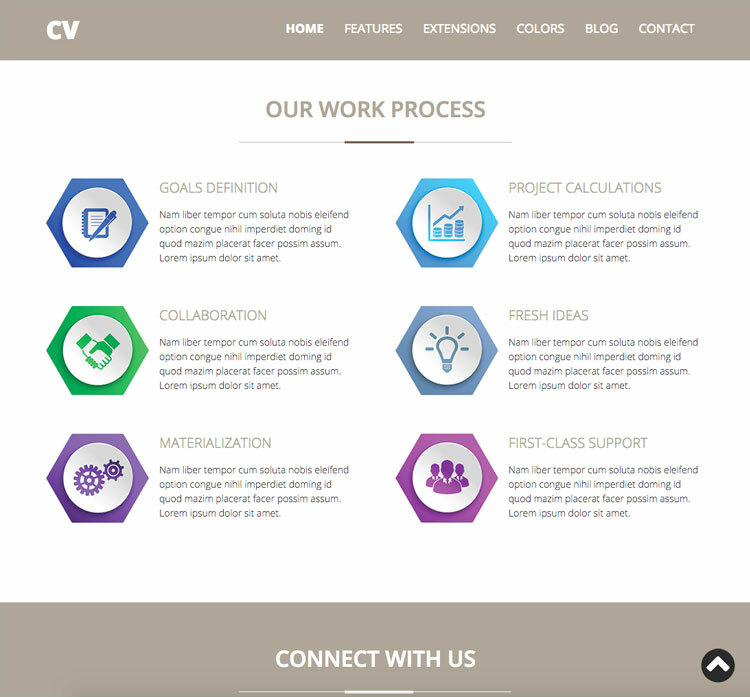 There are 6 Joomla articles on our demo: About Us, Team, Work Process, Social buttons, Portfolio and Clients). We believe that each Joomla portfolio template should have these articles, so your job will probably be just to change our sample data. You will notice that each article is styled differently. It's hard to guess this is just a collection of several Joomla articles, don't you think? About Us page should show the site owners' abilities clear. There's no better way for this than several bars that show the scale of experience from different fields. The Hot Bars module is therefore included here and it shows nicely designed CSS based bars. You can change the values in module properties easily. The Team page shows members of the team. Potential clients will trust more if they have an idea who's behind the site. Beside personal introduction, it's also important to show the working process to the client. This is included in the Working Process page. After necessary social share buttons, it's time to show off the samples of company's or freelancer's work. Basically, this is the most important part of any Joomla portfolio template. 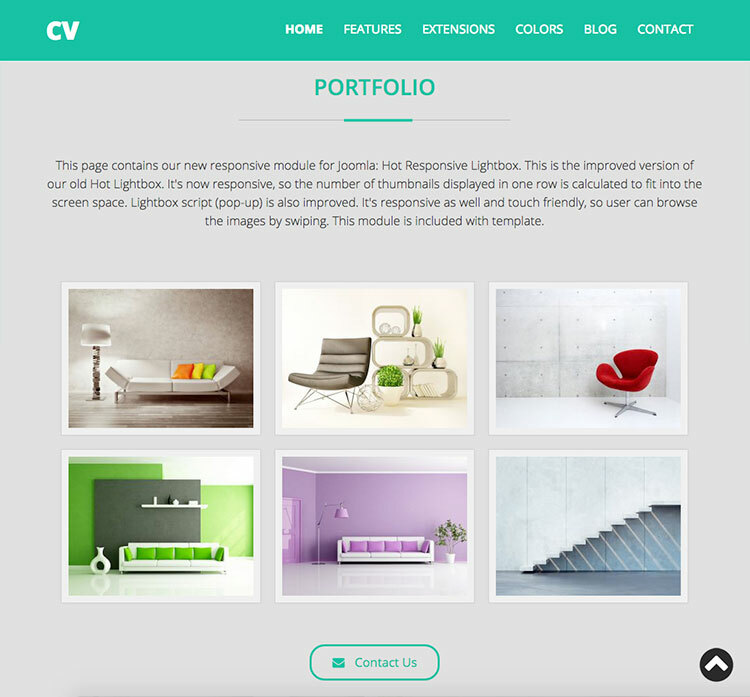 The Portfolio page contains our new Hot Responsive Lightbox module. This module works similarly as our old Hot Lightbox module, but it's now responsive and touch friendly. You just need to upload your portfolio images and point to that folder. The module will do the remaining dirty job for you. 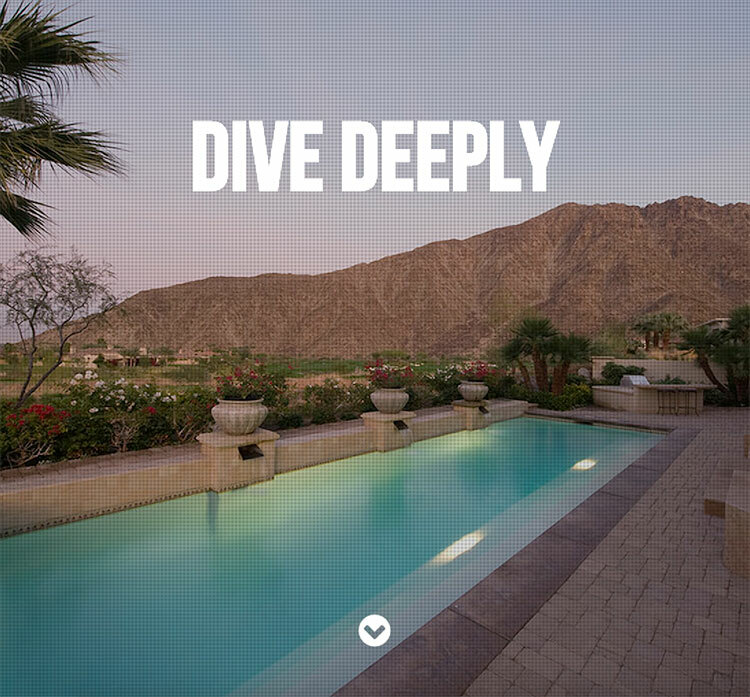 Finally, there's a page where you can feature your most important clients. Hot Film Tape module is suitable to show the clients' logos, so we included it on the Clients page. 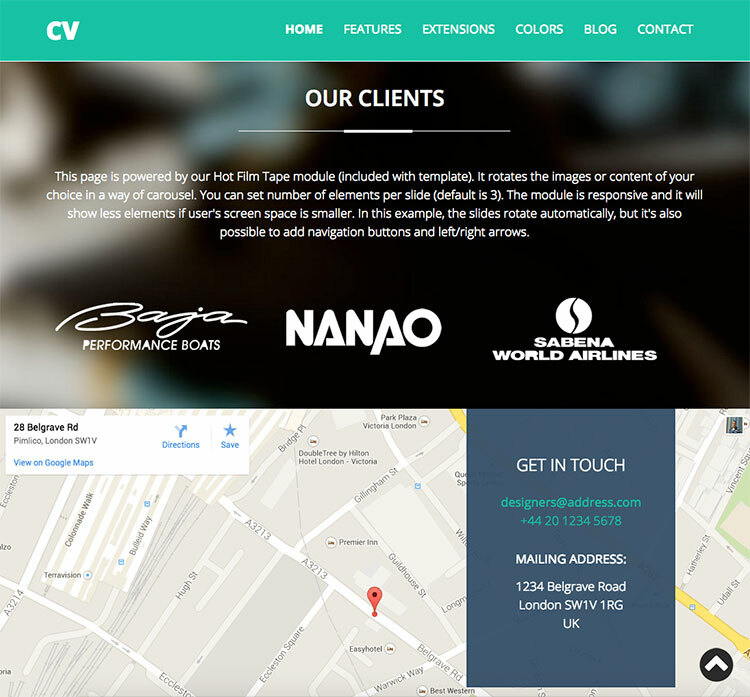 The bottom part of Joomla portfolio template is reserved for contact information. There's a necessary map with site owner's location (powered by Hot Maps module) and text box with address and phone number. Below that, we put a simple contact form (with anti-spam checker) that your potential clients can use to send you an email. 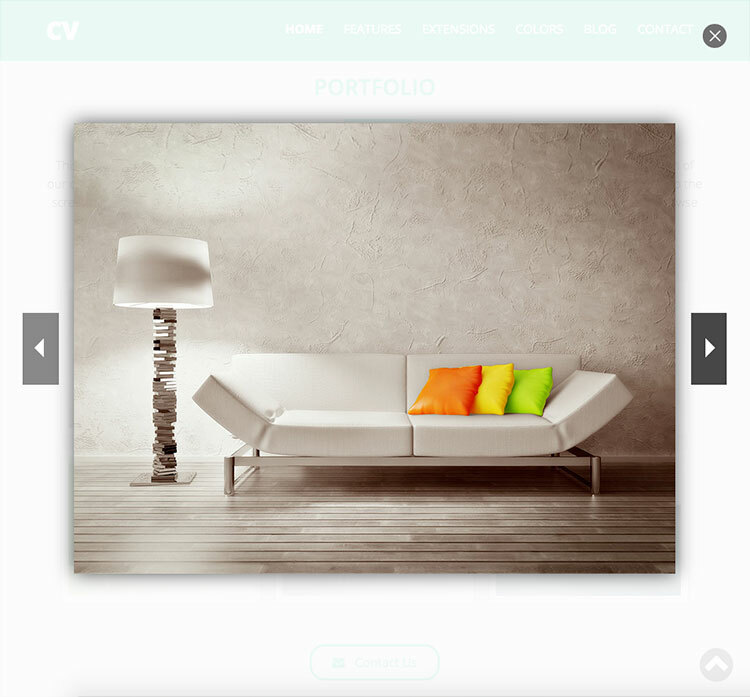 Although the home page of Joomla portfolio template is very long, this is not one page template. This means that you can normally have inner pages (for Blog in example). For all long pages a 'back on top' button is recommended, so we included one (can be disabled). Also, the top menu is fixed on the top, but it changes it's height depending of the scroll position. 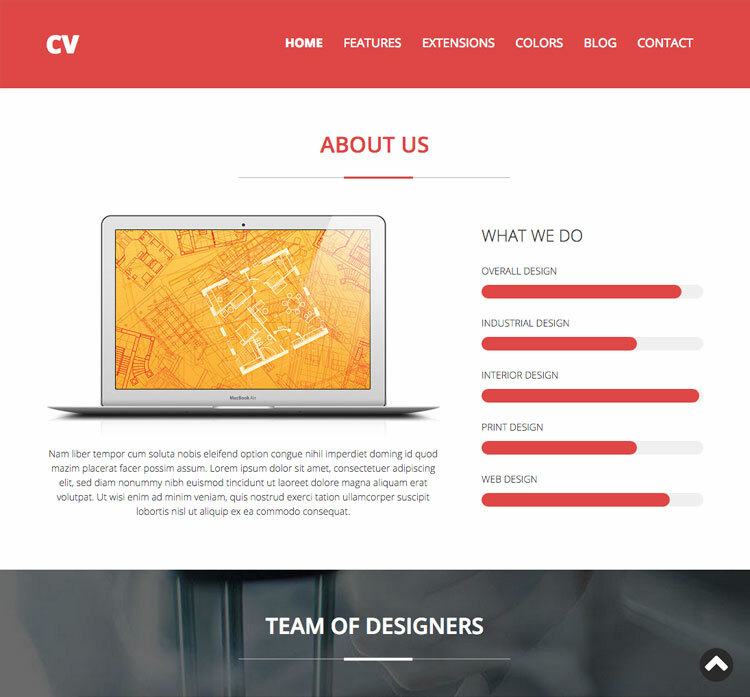 This is the first template from HotThemes collection that supports Joomla 3.x only. End of life of Joomla 2.5 is on December 31, 2014. That's why we think that starting Joomla 2.5 website is not smart at this moment. However, you can install template itself on Joomla 2.5, but HotStart installation is based on Joomla 3.x only. Several responsive Joomla modules are included: Hot Responsive Lightbox (new), Hot Full Carousel, Hot Film Tape, Hot Slicebox, Hot Bars and Hot Maps. 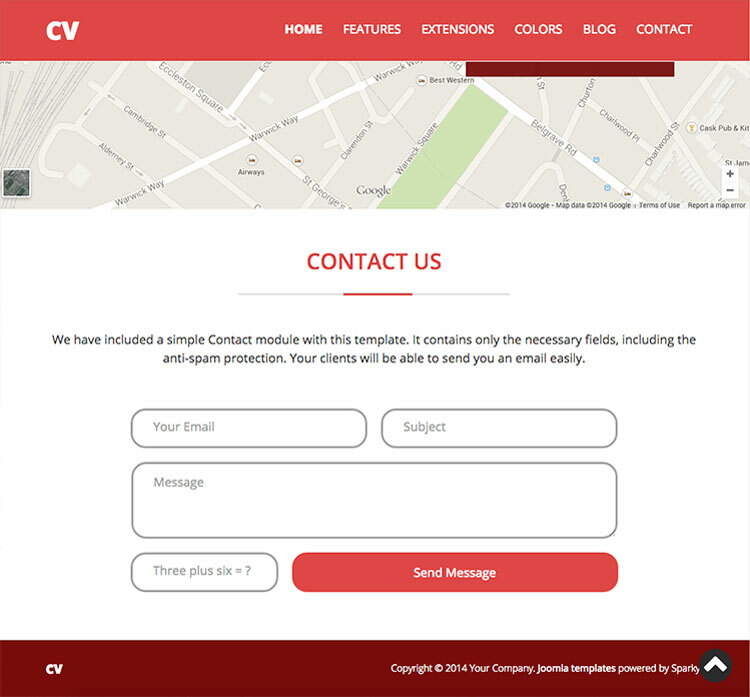 The contact form module is also included. 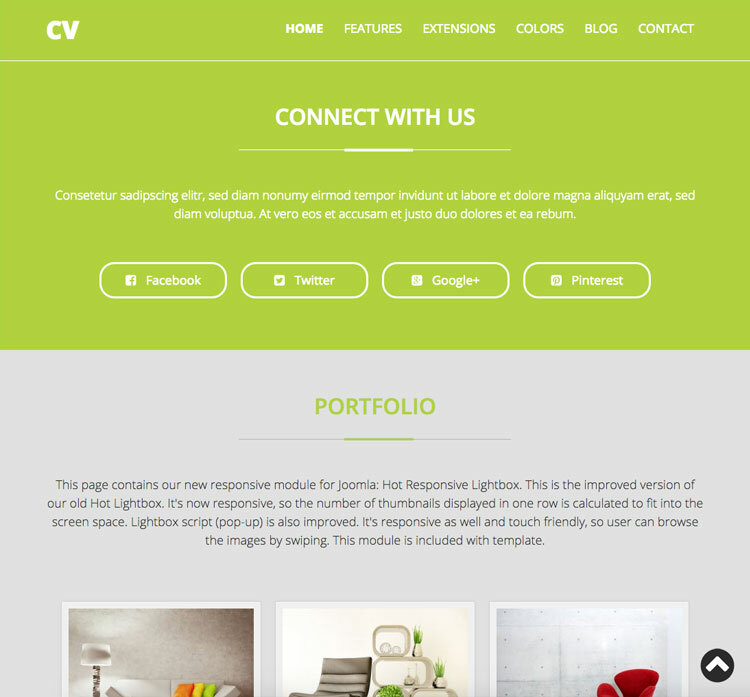 All these modules are included with Hot CV template without any additional fees (you save $15 per commercial module). All extensions are styled and configured for using with this template. 11 module positions are used in our demo. Unlimited number of module positions can be added easily within Layout Editor of Sparky Framework, if needed. There are 3 module positions that can be used in articles only (bars, clients and lightbox). PSD source file and all fonts are included. 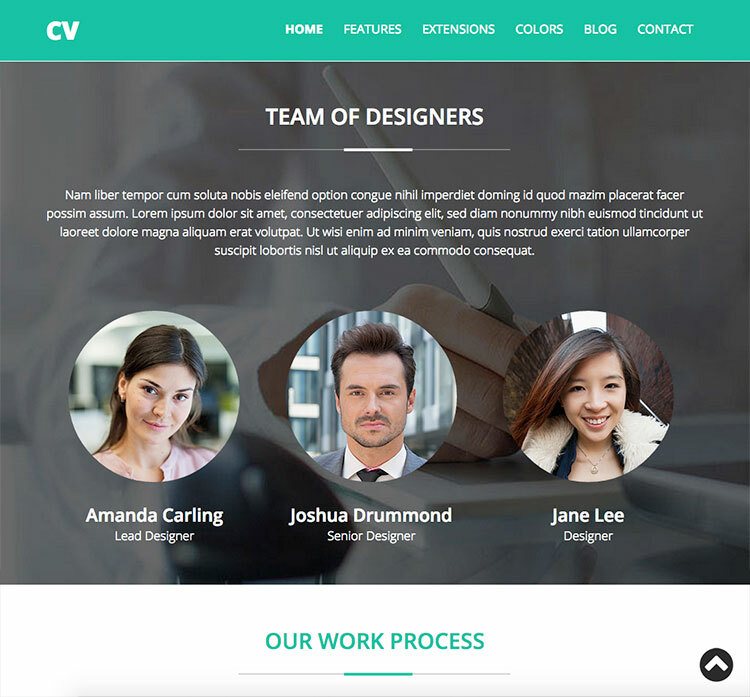 This template is tested with Firefox, Chrome, Safari, Opera and IE9+ browser (home page slideshow works on IE10+) for Windows and Mac. 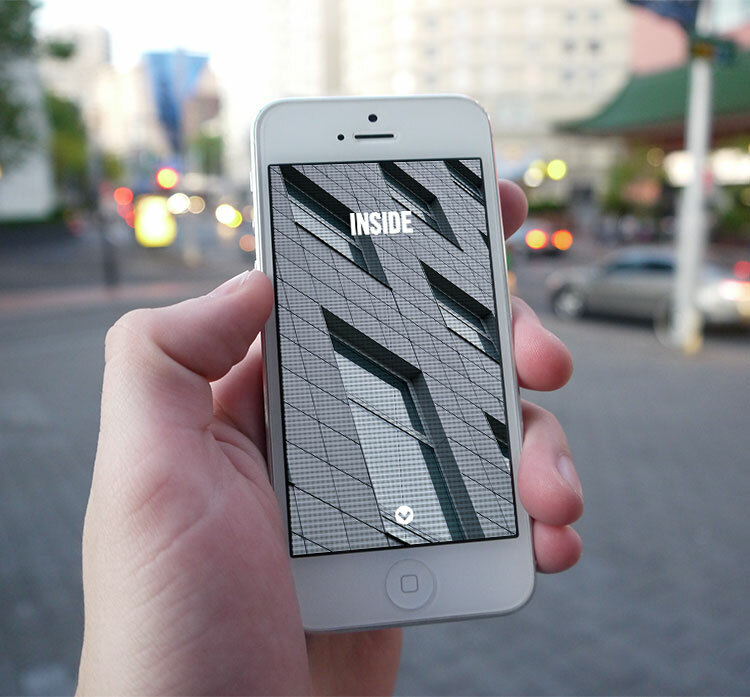 This template is optimized and thoroughly tested on iOS and Android mobile devices (tablets and smartphones).